When you are a new creation in Christ old things pass away, your past sins are forgiven, and you have a chance to create a new you a new life; a total transformation. When I became a Christian I was alot older than most and so I imagine for me it was a totally different experience than many new christians who grow up in church, and are saved at an earlier age between 7-10. No matter when you get saved, transformation will happen if you give your total life over to God, if you put your total trust in the love of Christ, and allow the Holy Spirit to work through you as a Disciple of Christ. 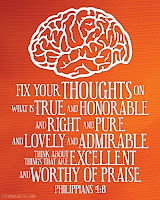 “Finally, brothers, whatever is true, whatever is noble, whatever is right, whatever is pure, whatever is lovely, whatever is admirable—if anything is excellent or praiseworthy—think about such things.” NIV (New International Version) I underlined the words which are different from the first translation in the second version. “And now, dear brothers and sisters, one final thing. 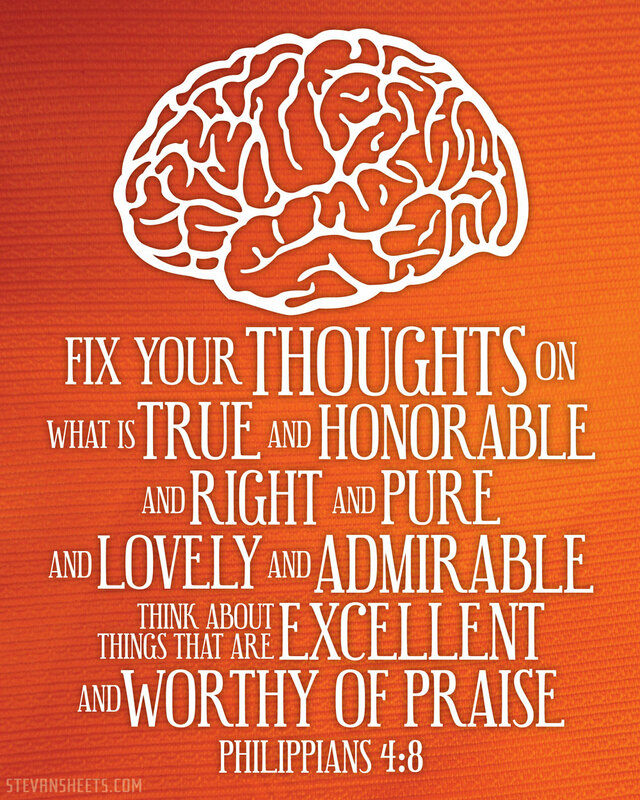 Fix your thoughts on what is true, and honorable, and right, and pure and lovely, and admirable. 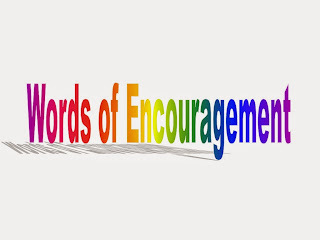 Think about things that are excellent and worthy of praise.” NLT (New Living Translation). Now what I do when studying this verse is get a dictionairy and write out each word and the definition so in this way I am expanding my understanding and knowledge and then I impress it in my mind in a way that is practical and applicable. For me this verse sums up to be think and focus your thoughts on whatever is good not on things that are bad or negative. 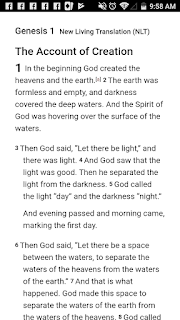 That's how I can remember this verse but I love going back to it and getting the fuller context and meaning of it as a reminder of the depth of our thoughts, minds, and the transformation that God does on our minds, hearts, and thoughts if we will let the Holy Spirit do His work in us and through us. In Verse 9 Paul is telling the Philippians to do what He does, practice what you have learned and you will experience God's peace. Don't just sit around learning the bible and continue acting the same way let this Word transform you and peace will be yours!